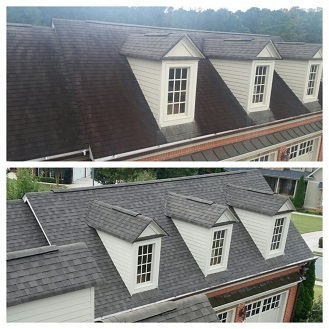 When it comes to properly cleaning and washing residential and commercial roofs in the Atlanta, GA area, the team at 1080 Pressure Washing is the only call you need to make. We are experiences in the soft-wash process needed to clean the roof of your home or business. This is typically a one day process that will not interrupt your day to day functions. Our process also protects plants and landscaping during the roof cleaning process that may reside under your roofing area. If you have spoken with a pressure washing company in Atlanta that mentions pressure washing your roof, run away quickly. Roofing systems are not designed for high pressure washing to remove the mold, mildew and streaks on your roof. The high pressured stream of water produced by a pressure washer will dislodge large quantities of the protective granules covering your shingles and leave your shingles vulnerable to the elements. This will lead to early roof failure and void any warranty that you may have on your shingles.